Discussion in 'Acceptable EMC Minecraft Mods' started by autumnrain26, Jan 8, 2014. 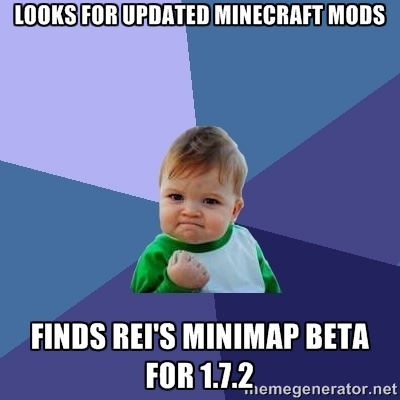 So I have been waiting patiently for mods to start updating and I found that ReiFNSK (The author of the Minimap mod), has released a beta release of Rei's Minimap for 1.7.2, via twitter. It is a beta as it does not seem to require modloader or forge to even run. I am posting anew, to avoid necro-bumping the old thread and ask for permission to use the beta until such time that the official build for 1.7.x is released. The twitter post is located here. Please put it in a jar because it can not be used Modloader and Forge. Slip_Stream and Mindlegokid like this. I didn't repost the link in the translation because of translation errors using babelfish.. xD ..The link can be found on the twitter post though..